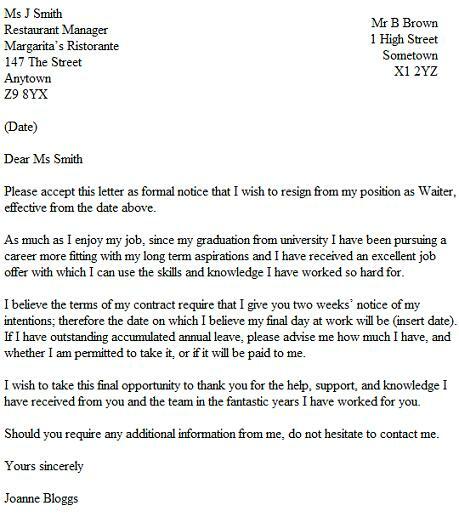 Waiter Resignation Letter Example can be used for waiters, waitresses for free. You should use this letter after amending it as suitable. You can also email this letter however it’s best to hand or post it to your employer. Please accept this letter as formal notice that I wish to resign from my position as Waiter, effective from the date above. As much as I enjoy my job, since my graduation from university I have been pursuing a career more fitting with my long term aspirations and I have received an excellent job offer with which I can use the skills and knowledge I have worked so hard for. I believe the terms of my contract require that I give you two weeks’ notice of my intentions; therefore the date on which I believe my final day at work will be (insert date). If I have outstanding accumulated annual leave, please advise me how much I have, and whether I am permitted to take it, or if it will be paid to me. I wish to take this final opportunity to thank you for the help, support, and knowledge I have received from you and the team in the fantastic years I have worked for you.